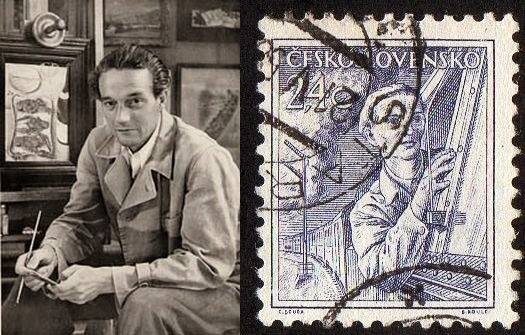 Before starting the post itself , and start showing the stamps I have today , I like to tell you something i have discovered last night... ; one of the stamps of the 1954 "Profession" series from Czechoslovakia that I used in my last post , was designed by Cyril Bouda , a Master Illustrator... if You put side by side , a photo of Bouda and the stamp , we notice that it is the Artist itself that goes "riding" the train, and the stamp is nothing more than a Self Portrait.. I will begin with some stamps from China PRC..the stamps are from a beautiful definitive series from 1981/1983 "China Scenery"
when I was ' surfing ' the Net , trying to find available data for Chinese stamps, I noticed that prices of the stamps from the beginning of the 80's are starting to rise, with some commemorative series already at high prices.. I think that we have to live with this fact , and eventually all stamps from the 80's will reach higher prices , due to the increasing demand.. The rest of this post is dedicated to Colombia stamps.. 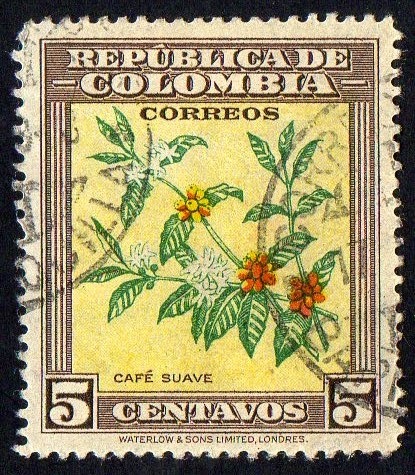 I want to highlight the influence of some British Printing Houses in this period of time of Colombian Philately... Company's like Waterlow and sons, Perkins Bacon & Co. and Thomas De La Rue capitalize most of the work from the early days until the 30's , 40's.. This first stamp I have to present , is damaged , I know (!) but it is beautiful...!! I don't know what is the purpose of the Hand writing , but it ruins the stamp (At least that's what I think..). 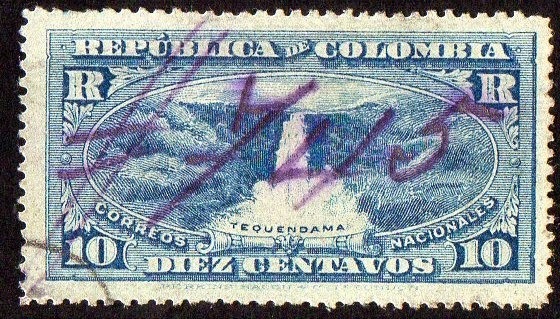 the stamp, showing us the Tequendama Waterfalls , belongs to series (2) 1917 "Landscapes (??)" 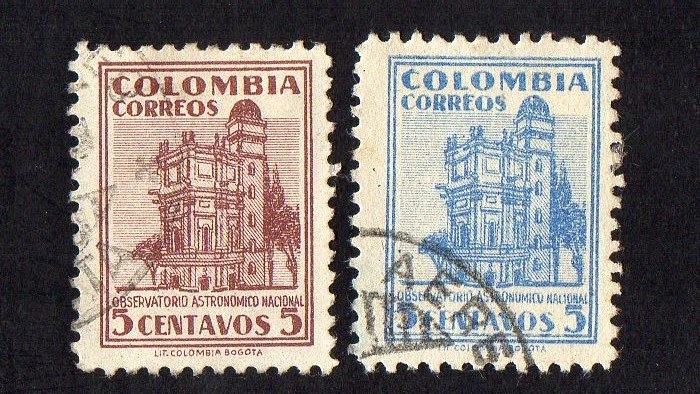 For these Colombian stamps , I could not manage to get Designers and engravers data... in this case , even the Printing is unknown . 4 stamps of a series (6) 1932 "Colombian Resources" ; we can see that in the pictures we find , the petroleum , coffee , gold and emeralds Industry's .. these motifs are common to other series , as We will see..
stamps from a series (15) 1932/1939 "Resources" ; all the values have been issued in 1932 and two extra stamps of 15c and 20c were issued in 1939.. we have now coffee , banana, cattle, and petroleum motifs..
[Left] stamps from a series (3) 1937 " Barranquilla Industrial Exhibition"
[Right] Complete series 1946 "Bogota Observatory"
from a series (11) 1945 "Natural and Historic Sights of Colombia" ; in the pictures presented there are three different motifs.. The Fort of San Sebastian in Cartagena, The Tequendama Waterfalls and the Santa Maria Bay. [Left] Complete series 1947 "Coffee Plant"
[Right] from a series (22) 1956 "Regional Industries"
Ufff.. this was a long post. !..